Here at TONI&GUY Dorchester we pride ourselves on a friendly and professional service throughout your salon experience. We opened the salon in the town centre in 2004 making it easily accessible to clients living in the town and surrounding areas. Our strong team of passionate stylists and technicians have been working hard in the industry for over a decade! During this time they have gained recognition within the company at competition level. 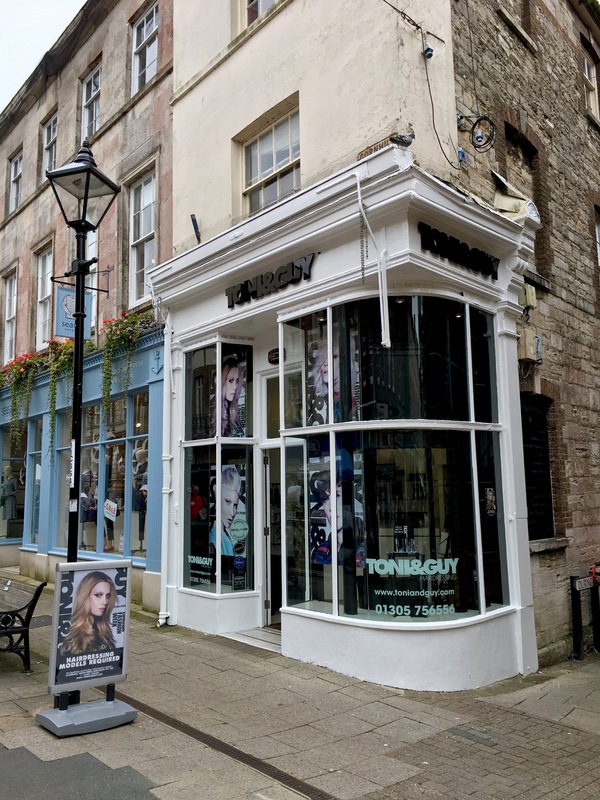 At TONI&GUY Dorchester we have a strong work ethic and comfortable salon feel, to help give you exceptional results and a relaxed experience. All of our team are willing to help and advise, be it with new colour, creative styling or to find the right product to help you recreate your salon style. We will ensure your visit to TONI&GUY is the ultimate salon experience. Always get great service here! the treatments are fab! Matthew always does a lovely cut and finish on my hair. He's friendly, professional, and I cannot fault his excellent level of service. The only issue which happened this time and also on a previous visit was the running time. On arrival I was told Matthew was running 20 minutes late, I expressed the fact this would put my day out and It was suggested by one of the girls to go away and then come back for a bit or she could look at what appointments they had on another day. This was not good customer service and unprofessional. In total I waited 30 minutes for my appointment, I was compensated by having £5 taken off of my wash cut blow dry however I don't think any customer should have to wait 30 minutes for an appointment. If they could get the waiting times down to 5mins or less it would it be perfect. Thank you for your comments, we do endeavour to keep to time as much as possible, however even with best made plans, this can sometimes be the case. I am pleased to see you were compensated with £5 although I understand this doesn't help with your plans that you had made and I am so sorry that we put your day out. Really pleased you were happy with the cut and service and I will be looking into this matter further to try and prevent this from happening in the future. Absolutely amazing. Very professional. Understood exactly what I wanted. 11/10. Matt is the slickest! Thank you Caroline! Very pleased as ever .. not just Matt with his brilliant cut, but Tia with my colour. Thank you both! Thank you Sally! Ill pass this on to both of them! Colour with Tia, hair cut with Matt. Fantastic salon, very professional and a great experience. Have been going there for around five years now. Thank you Mary! great to hear from you! Emily is a great stylist and the tea is fab. Loyal customer as my hair looks great. Thank you Martin! I'll get some decent loose leaf tea in for you next time! Great cut and good wash with v nice service with green tea! Nice people. Thank you Liz! You always brighten our day! The stylists and technician here are fab! They know exactly what I want and never fail to impress! The girls who are in training are also very lovely and always have a smile on their face which is great! Lovely atmosphere! Great environment! Thank you! Ill let Emily know! she will be thrilled! The best colour i have ever had! Tia is amazing at what she does, she gave me the exact colour I wanted and made me feel so welcome! the blonde girl who washed my hair was lovely too! aw thank you! ill let tia know! Always good service from the moment I step in the door, and always walk away with a great result! My daughter had her hair cut by Emily. Could not have found a nicer, kinder young lady hairdresser! She was brilliant with children, patient & kind. She also did a great job too. Thank you for this lovely review, I will let matt know! Always so so happy with the finished result! Couldn't fault the staff! So friendly and all super lovely! Thankyou so much Tia in love with my hair! Will be sure to be back! Thank you Francesca! I will let tia know! Great haircut and conversation as always. Thanks Matt. Lovely warm welcoming from Ross, he makes you feel very comfortable from the minute you walk in to the salon. Emily is my stylist and she knows exactly what I want and gives me a detailed consultation which I love. Very happy with my results every time! Such a lovely team of people and great experience!